She made my son cry and later told me I was a bad mother. On Saturday Finn and I went over to the local Loblaws to pick up some ingredients to bake cookies. Everything was happy and fine until we got over to the dairy section. I was both navigating weekend congestion and maneuvering around a stock boy to grab some eggs when it happened: Finn coughed. It wasn’t a wheezy cough. It wasn’t a phlegmy cough. It wasn’t a sick cough. It was the kind of cough anyone makes when they need to clear their throat or the air is dry or or or … it was the kind of cough humans make. I asked him to cough into his arm, which he’s usually very good at, but his bulky winter jacket made it tough. While this was going on, a shopper turned around to inspect us. Looking directly at Finn, she made a horrible gesture towards him. She scrunched up her shoulders into her pinched face and shook her head back and forth while making a gutteral sound of disgust. It was such a forceful and conscious demonstration that Finn broke down and cried. I asked her what was wrong with her and she walked away. I yelled after her and told her she could not act that way towards my son and she continued to walk away. I yelled again, across the grocery store, that she was a horrible woman and she disappeared down the baking aisle. People were looking at us, unsure how to react. They of course did not know what happened. All they saw was a crazy thirty-something yelling at a nice old lady. I didn’t care. I consoled Finn and we went about our business. I couldn’t get this incident out of my mind. How cruel and insensitive do you have to be to act that way towards a child? Yes, I’ve seen the kid with the goopy booger-face and been grossed out myself – I get it – but this was different. He just coughed. I saw Queen Mary again in the checkout line and we ended up having a fight. I asked her if she realized she made my son cry and she told me I was a “terrible mother” and that my “son was very sick and should be at home”. As soon as I heard the bad mother part I walked away (well, if I’m being totally honest, I called her a “wretched woman” first, told her Finn was “not sick” and then walked away). Imagine the layers and layers I’d have to unwrap to get to a place to have a normal conversation with this person. So much judgement. If she knew me, she’d know how careful I am when it comes to illness. If she knew me, she’d know I keep Finn home from daycare and away from the outside world at even the slightest indication of illness (this is one of the priviliges of working from home). But for her one cough meant bad mother and terrible sickness. Anyhow, that’s what happened. It’s not the first time I’ve had strangers comment on my parenting but it’s the first time that it affected Finn. So take that lady, he’s got your number and he’s only 2 and a half. $20 says she likely never had kids of her own. $50 says if she did have kids, they’re some where with a therapist working out what a smothering, critical person their mother is. 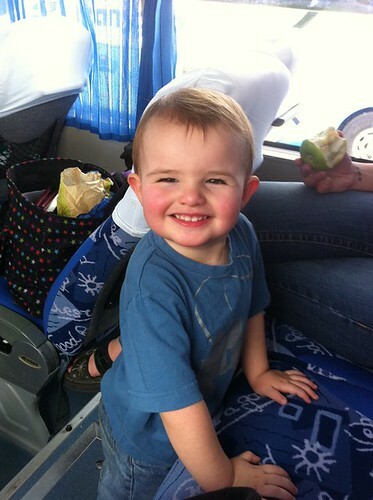 oh my life, what a gorgeous happy little boy you have, he’s adorable. Similar things have happened to me and so you completely have my sympathies. I admire you for having the gumption to stand up to this horrible judgemental woman. Well done for standing up for mums everywhere. Good on ya from England!! btw, your boy looks soo cute! I LOVE that you had the balls to stand up to her! Good for you! What you needed to ask yourself is, Is it true? If not, it is her problem, it is her judgment and her need to be right. Drop it and pay no attention to what other people think. You cannot change her opinion , you can only be in charge of your response…and remember little ears and eyes watch you and learn. Life is a set up, to see how we will react to it. Pat, for the most part I agree with you. However, I want my son to learn when to speak up and when to walk away. This was one of those times when speaking up and telling someone that their behaviour was not okay was necessary. Oh geeze! Your poor little guy 🙁 This reminded me of a time where a baby was crying in the checkout line at the grocery store, and the woman behind the mother of the child said “you better shut that kid up before I make it shut up.” Who do these people think they are? !